If you are familiar at all with Utah baby names, probably the last adjective that would come to mind is “mainstream.” Utah parents certainly have a well-earned reputation for staying creative in that department. Most of the distinctive Utah names just bounce around the state for a few years before going away (think Tayxa and Felecya), but a surprising number of them actually catch on outside of Utah and go mainstream. 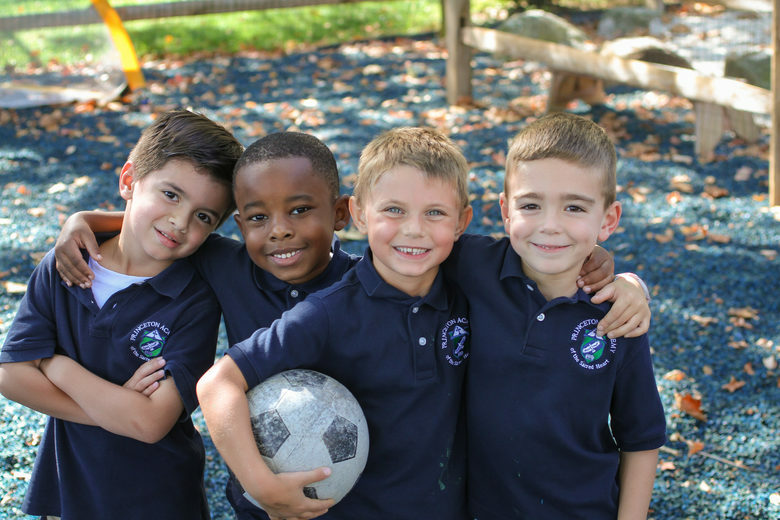 Parents of preschool-age children will recognize the recent nationally-trending names like Jaxon and Aubree. These names first became popular in Utah over a decade before becoming popular everywhere else. The same goes for other current fad names like Riley, Paisley, Braxton, and Lacey. But getting our latest naming fads from Utah is nothing new, either. Looking at the last 100 years in America, newly popular names have gotten popular in Utah an average of 5 years earlier than the rest of the country, earlier than any other state. It’s not for nothing that Utah has been called the Name Prophecy State. Many of these names didn’t just get picked up a few years earlier in Utah, but spent decades as just Utah names before getting picked up elsewhere. The first surprisingly Utah names is Evan. Below is a graph of the history of the popularity of Evan in each state since 1910. The rows are each state, and the columns are years. Darker means more popular. We can see that Evan was almost exclusively a Utah name for most of the 20th century, almost unheard of elsewhere for at least 70 years, which is an insanely long time for a name to be common in one state and no others. Why Utah and nowhere else for so long, you ask? It’s anyone’s guess, really, but one reason might be that the name Evan is actually an old Welsh name, and early-20th century Utah was in fact home to a large population of Mormon Welsh immigrants. 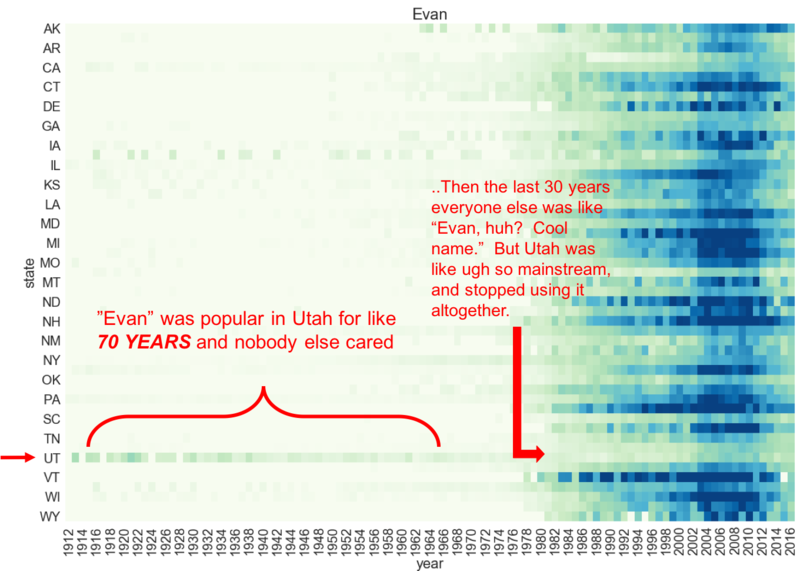 Whatever the reason, though, Evan basically didn’t catch on in a big way outside of Utah till the early 1980s, peaking in the mid 2000s. Utah was super hipster about it, too, because right about the time parents in other states started using Evan, Utah stopped altogether, and now Utah is one of the states where the name Evan is least popular. Cold, Utah. Cold. 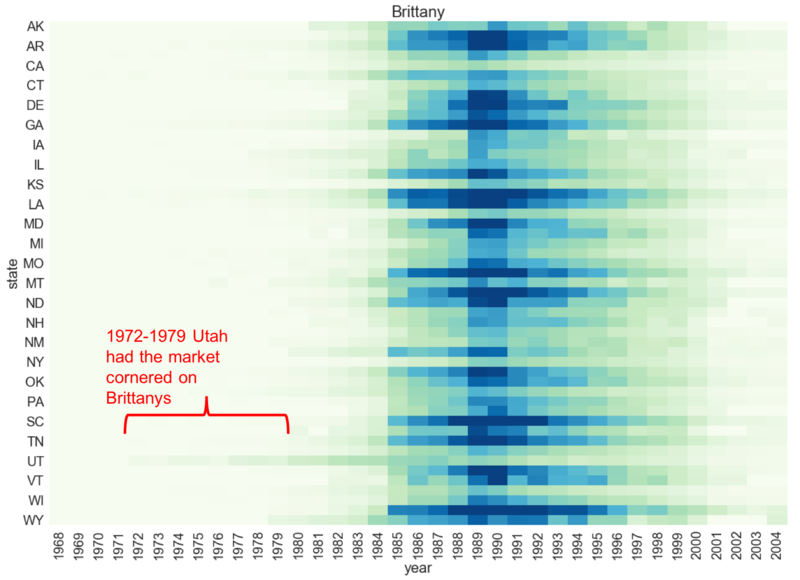 This is going to blow your mind, but Brittany, which was the third most popular girls name of 1989-1991 and one of the fastest-trending fad names of all time, started as a Utah name. In fact Brittany was big in Utah 6 or 7 years before exploding nationally in 1985. I know what you’re thinking right now, and you’ll be happy to know that the alternative spelling Britney, (as in Spears) also came out first in Utah around the same time as Brittany. That Utah would popularize multiple spellings of the same name at the same time will come as a surprise to absolutely no one who has ever lived in Utah. Brent was Crazy Popular in Utah back in the day. 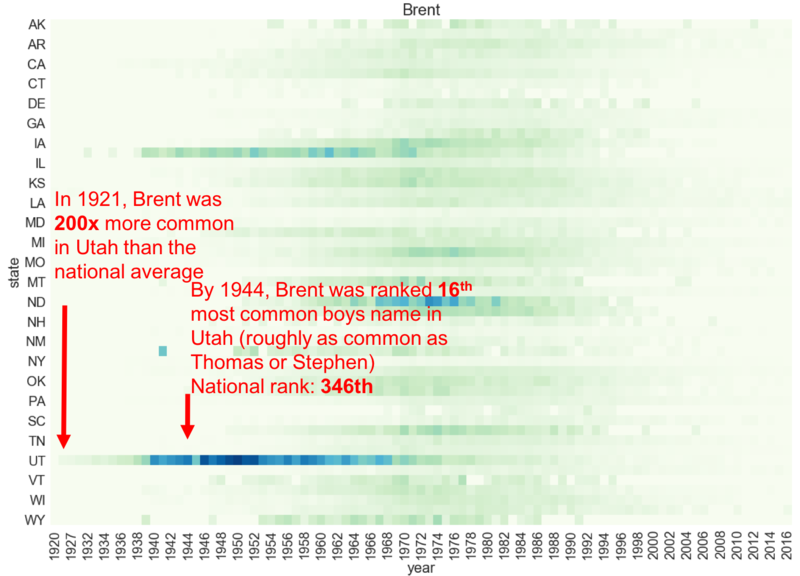 There was one point (1944) where the name Brent in Utah was ranked 16th in Utah, vying for popularity with the likes of Thomas and Stephen, but in the rest of the country it was ranked 346th. Scott and Chad for their part were less trendy overall in Utah than Brent or Kent were in their day, but on the other hand, they were even more exclusively Utahn. They both existed basically only in Utah (not even Idaho) for an extremely long time — 50 years or so — before getting big nationwide in the 60s and 70s respectively. The rise of the baby Coreys and Corys in 1969 was basically overnight. It’s like new year came and the world just decided all at once to all name their babies Corey. I have not been able to figure out what famous Corey all these kids were named after (maybe Simon and Garfunkel’s 1966 song Richard Corey?). Regardless, 1969 was the year Corey came into its own. However, there had already been little baby Coreys and Corys running around Utah for almost twenty years, since about 1950. (Idaho, Montana, and North Dakota were relatively early adopters in the late 50s, but Corey/Cory was a thing in Utah 6 or 7 years even before those). Again with the multiple spellings. 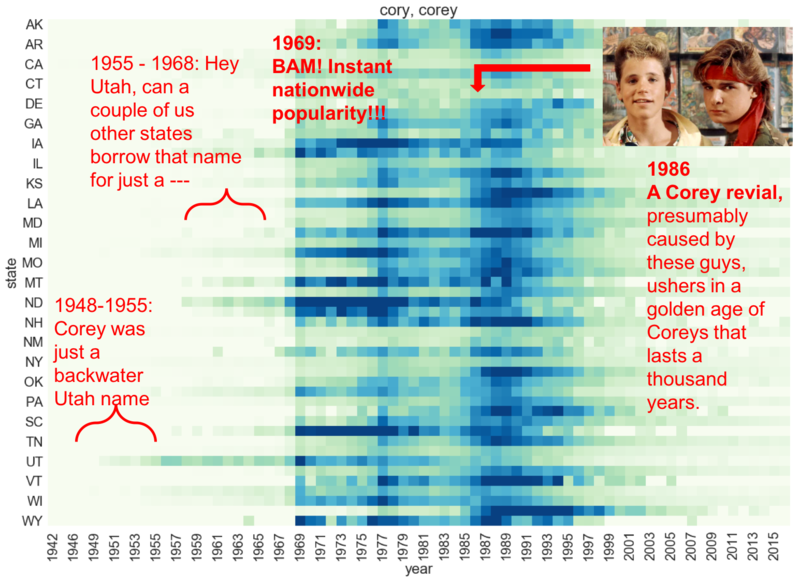 One interesting thing is that unlike the Brittany/Britneys, the alternative spellings Cory and Corey were equally popular in their day; nobody really agreed on which was the normal way to spell it and which was the hipster way. Welcome to the Unspellables, which is the term I give the still-going-strong fad of naming boys in such a way that after you hear their names you still have no idea how to spell them. Their respective consonants come packaged with any combination of vowels you can think of, but I’ve listed the most popular above for your convenience. 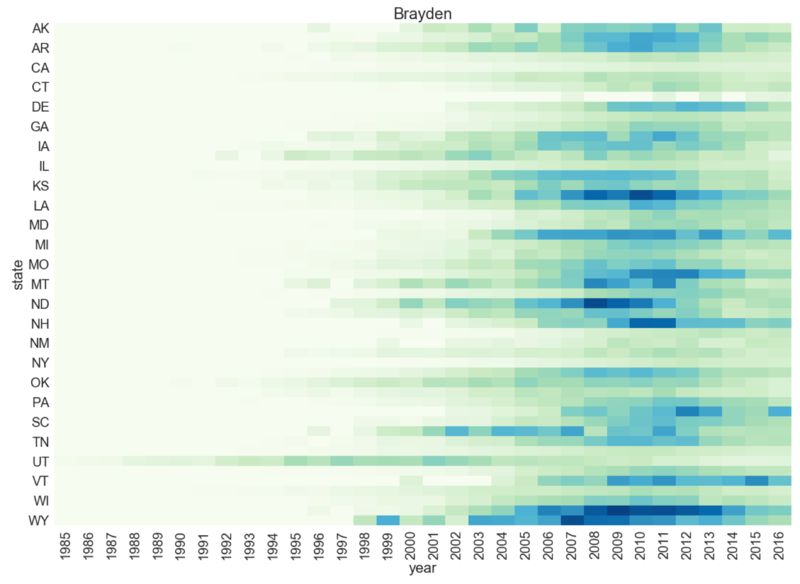 While all of these names are currently trending, the whole -aden suffix thing seems to have actually started around 1985 in Utah (of course), with the name Brayden, which lived alone in Utah for the first ten years or so before other states started to pick up on it. 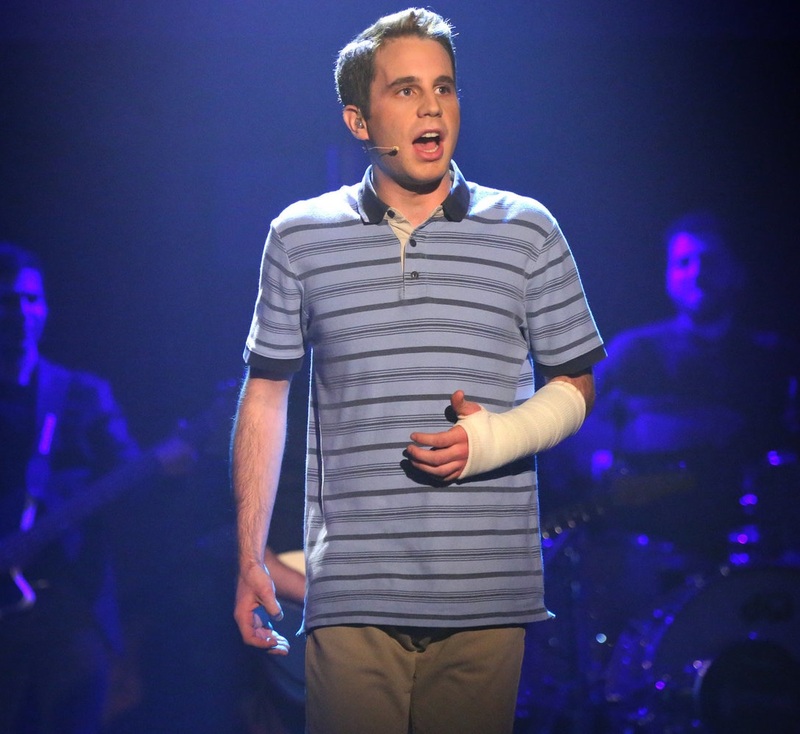 This is going to blow your mind, but in Utah there are 30-year-old men named Brayden. By the time the rest of the country caught on, Utah parents had already adopted the very popular spinoffs Kaden (Caden) and Jayden (Jaden), which, like Brayden, stayed in Utah for about 10 years before going mainstream. Tired of Y sounds but still pumped about terminal Ns, in the late 1990s Utah started cranking out its first batch of the latest and greatest in boys names: Jaxon. Or Jaxson. (or Jaxsen). 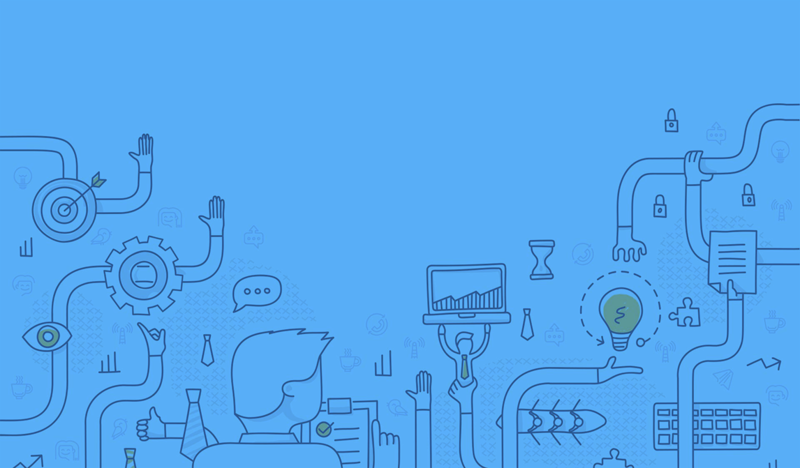 The name began trending on a national scale around 2010. Alternative spellings of “Jackson,” (and actually all forms of alternative spellings) are currently one of the hottest things in baby naming today. And we can all thank Utah for that. Thanks, Utah. Thanks just so much. 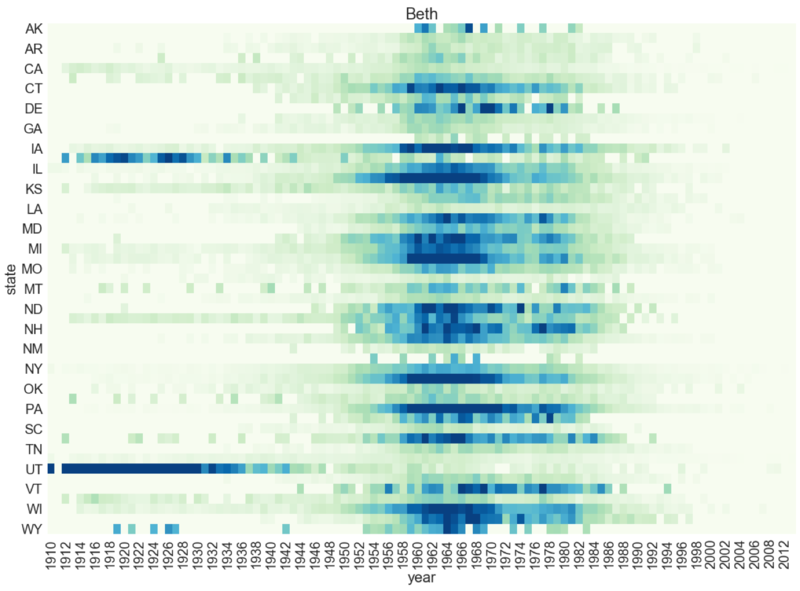 Most commonly short for something else (Elizabeth or Bethany), the practice of actually naming your daughter the short version Beth was first made popular in Utah and Idaho in the 1910s and 1920s. In 1920, Beth was the 7th (!) most popular girls’ name in Utah and 50th most popular in Idaho (but only ranked 350th nationwide). As happened later with Evan, by the time Beth got popular outside of Utah (early 1960s), Utah was basically over it. 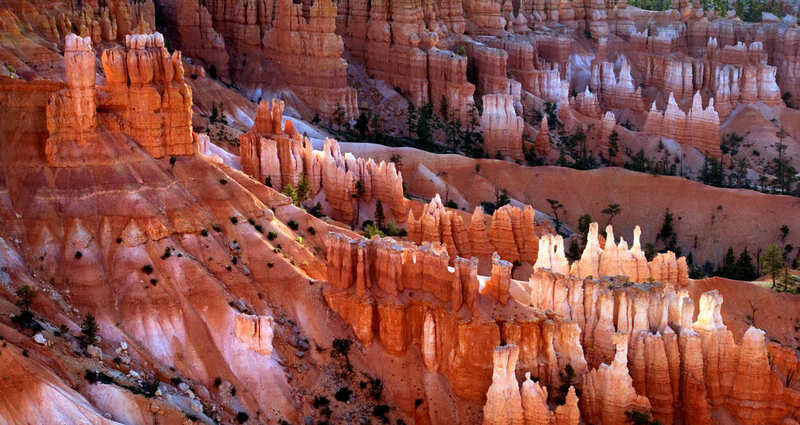 … the year after Bryce Canyon became a national park (1928), parents in Utah started using Bryce as a first name for baby boys. The name slowly gained popularity in Utah over about, oh, 50 years or so until in the late 1980s something happened and Bryce went mainstream. History! 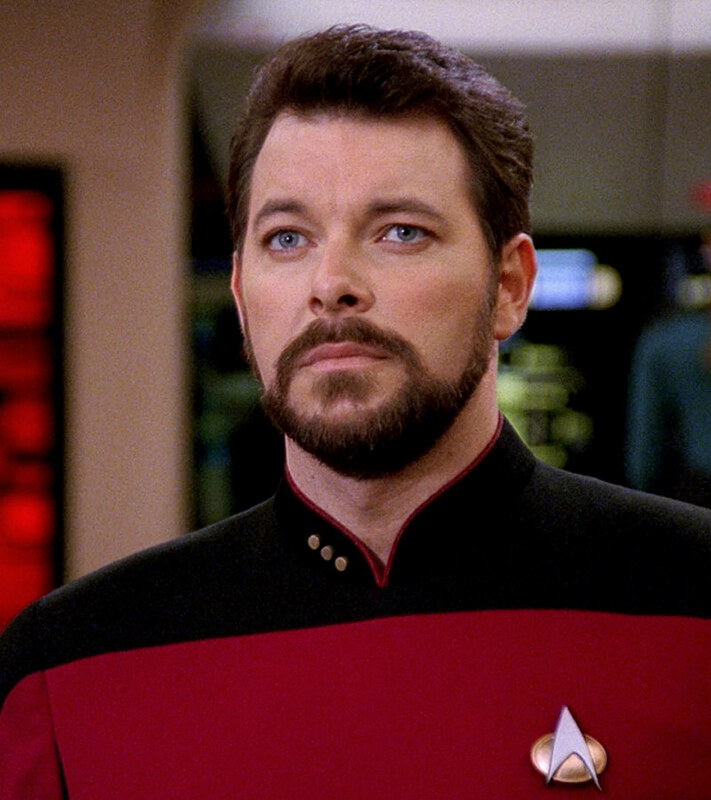 You might not think of Utah as a particularly trekkie place. 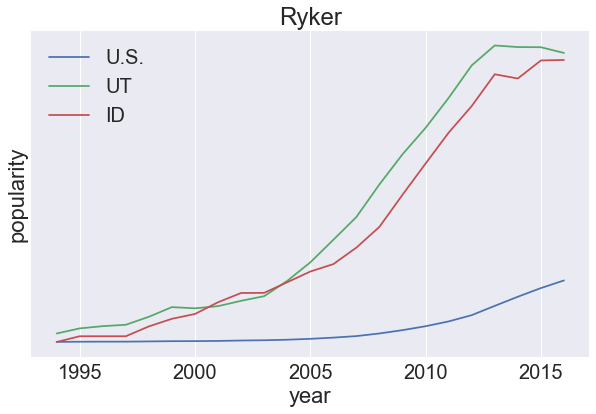 But once you find out that Salt Lake City is home to one of the larger Comic Cons, and that Mormon authors are startlingly dominant in scifi-fantasy genre, maybe it’s less surprising that Ryker was popular in Utah and Idaho about a decade before it was cool. McKenna was one of the innumerable Utah girls’ names starting with Mc- that started popping up in Utah throughout the 1980s but really took off in the early 1990s. 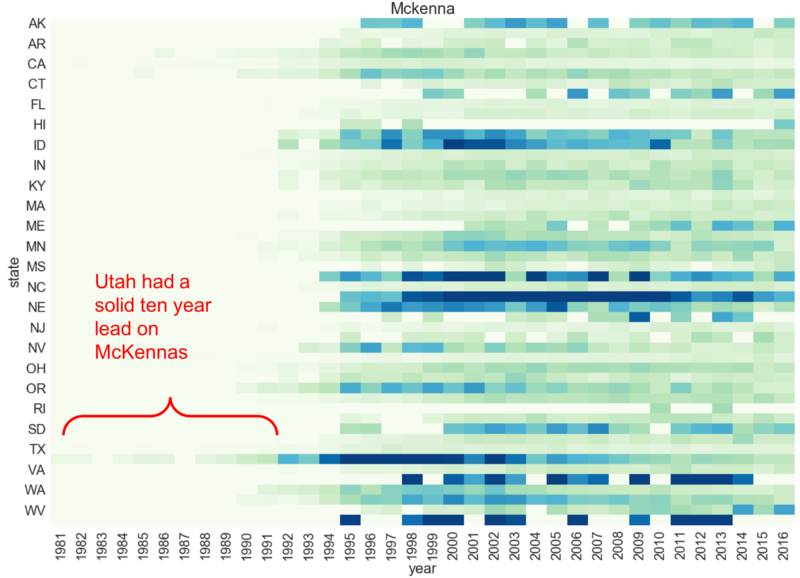 Unlike names like McKell and McCall which never made it out of Utah (and went on to become the 2nd and 4th most distinctively Utah girls’ names of all time), America for some reason just liked the name McKenna and picked it up in the late nineties and early 2000s. 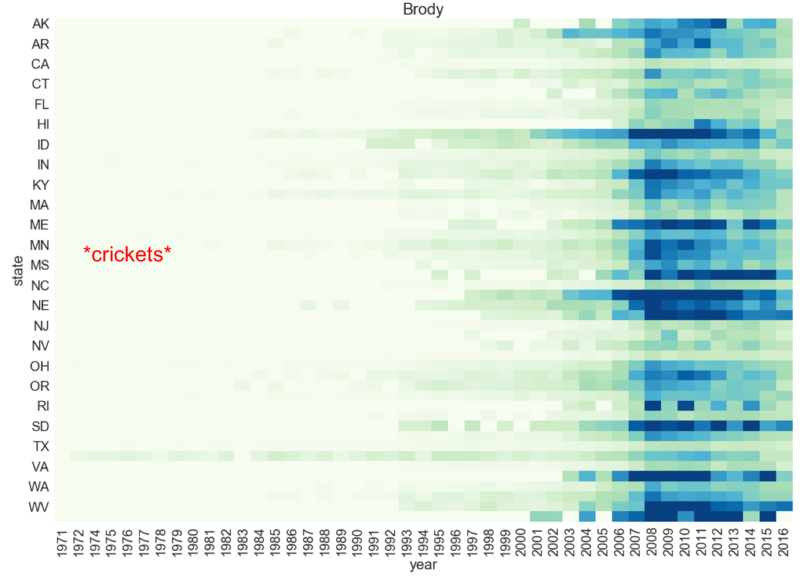 Utah’s has been putting the bro in Brody since 1971, a full 9 years before the name even shows up in the data for any other state (Oregon, in case you’re curious). That’s a really solid lead on Brodys. In case you’re wondering (because I know you are), Brody Jenner, the Brody to end all Brodys, was born in California in 1983. That would have been a bold and unique name in that state that year. As you can see above, Brody was still not common enough in 1983 California to make the SSA cutoff that year, meaning in the entire state of California there were a couple of baby Brodies, max. Not so in Utah, where Brody was old news by then. There had been Brodies aplenty in Utah for twelve years already by 1983. Better luck next time, Jenners. Better luck next time. I’ll end it here, but honestly we could probably go on all day. As already mentioned, trendy names tend to catch on in Utah five-ish years before everywhere else, so there are plenty of examples we could cover. Honorary mentions not included here: Brooke (popular since 1966 in Utah and not till 1976 elsewhere) , Easton (1998 and 2010, respectively) and Blake (1946 and 1981). So if you’re looking to get ahead of the baby naming curve for your little one, why not give some trending Utah names a try? Kayzlee or Taggart, anyone?